“This will be the Blue Century”. That’s according to Karmenu Vella, EU Commissioner for Environment, Maritime Affairs and Fisheries in his introductory remarks at a meeting of ocean research leaders in Brussels yesterday. Mr. Vella called the special roundtable meeting to discuss key ocean research challenges including climate change, food and energy security, and EU Blue Growth. 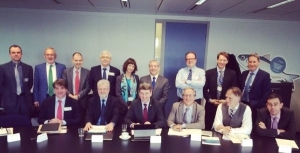 The meeting was attended by the Heads of several national ocean research institutes and Directors of some of the key European and International cooperation platforms for marine science. The EMB was represented by Executive Secretary, Niall McDonough. Commissioner Vella, along with colleagues from DG Mare and DG Research & Innovation, listened as each of the invited guests gave a short presentation on the major research challenges. In the subsequent discussion, Mr. Vella emphasised the importance of enhancing collaboration between Europe’s leading research institutes. He strongly believes that ocean science has a critical role to play in addressing many of our most pressing societal challenges. “In the oceans, we can find solutions to our land-based problems, ” he said. All agreed that many of these challenges are global and enhanced cooperation is critical to achieve the scale of research efforts necessary. The Commissioner committed to playing his part in advocating for adequate investment for ocean research and technology development. The meeting with Commissioner Vella marks the first in a series and will be an important platform for the ocean research community to communicate directly with the Commissioner on ocean research issues.